THE House of Lords has been urged to stop “fighting yesterday’s battle” amid fears of a bid by pro-European peers to delay and weaken Brexit. “If they do try to obstruct Brexit they will be signing their own death warrant,” senior Tory MP Philip Davies warned. 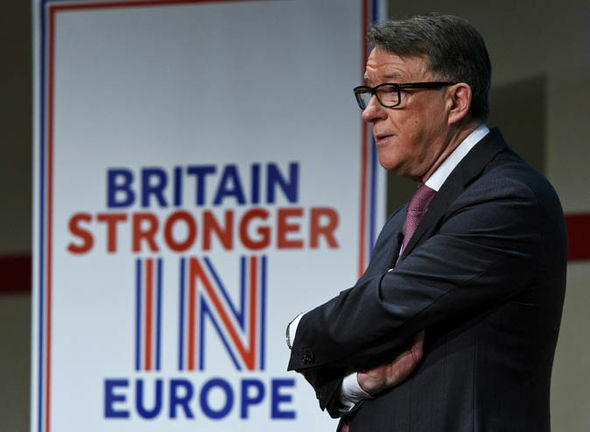 Earlier former EU Commissioner Lord Mandelson had urged the Lords not to “throw in the towel” on changing the Government’s policy on leaving the bloc. And former minister Lord Hain said he had a “mandate” to seek amendments, including keeping Britain in the single market. Legislation was overwhelmingly passed in the Commons but must now undergo scrutiny in the upper chamber – starting today with discussion of its broad principles and continuing next week with possible amendments. Anti-Brexit peers in the chamber, where the Government does not have a majority, are expected to try to write in changes to the Bill. These could include demands for a “meaningful vote” for Parliament on Theresa’s May’s final deal with Brussels, and moves to guarantee the rights of EU citizens already living here. Although the will of the people and Commons is expected to prevail, enabling Mrs May to trigger her Brexit talks by her March 31 deadline, pro-EU peers could hold up proceedings. Cabinet Minister Liz Truss said she fully expects peers to “recognise the will of the people and the will of the House of Commons, which was overwhelming, to pass that legislation”. After pro-European Lord Mandelson spelled out his objections to the Government’s “hard Brexit” proposals, Justice Secretary Ms Truss told BBC One’s Andrew Marr Show: “It was like the referendum had never happened. “He needs to move on, and the Labour Party need to move on, because we are now in a new reality. He is a blast from the past. “People who are trying to fight yesterday’s battle need to join us in making a success of global Britain,” she added. Referring again to the former Trade Secretary, she added: “Peter Mandelson and others in Labour who are trying to frustrate the will of the British people need to think how they can contribute to making Britain a success post-Brexit. Labour’s official policy is to pass the Article 50 Bill rather than try to reverse the referendum result. But pro-Europeans have been heartened by a call last Friday by former Labour PM Tony Blair urging them to unite to fight hard Brexit. Lord Mandelson said that while the elected Commons must prevail on the legislation, the country would be badly damaged by a “Brexit at all costs,” and he hoped peers would “not throw in the towel early” when it comes to wrangling with MPs about details. 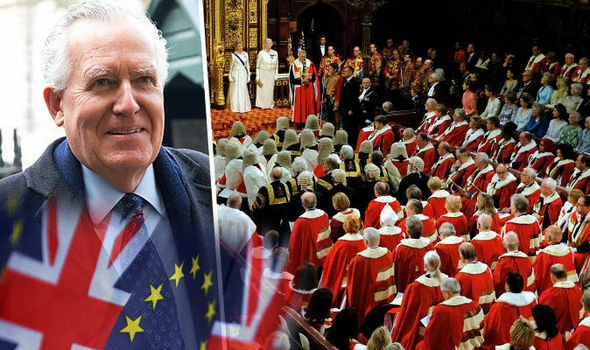 Former Labour Cabinet minister Lord Hain claimed he had a “mandate” to seek amendments, including trying to keep Britain in the EU single market. That’s what I am reflecting, that’s my mandate.” It was revealed yesterday that more than 20 Remain peers enjoy generous pensions for past service as MEPs or EU officials. He also advised peers to be careful. An ICM survey found 43 per cent of people would be more likely to want to scrap or reform the Lords if it obstructed Brexit. ‘More than 20 peers expected to force changes to the Brexit Bill this week are still earning tens of thousands of pounds from Brussels, it can be revealed. Lord Mandelson, Labour’s former communications director, Lord Kinnock, the party’s former leader, and Lord Patten, who served in Margaret Thatcher’s cabinet, all still receive EU pensions. Many other former MEPs and European commissioners are also receiving payouts from a Brussels pension pot estimated to be worth £10 million. The global elite is getting desperate and will stop at nothing to prevent their plans for a New World Order. Many of the House of Lords members including Peter Mandelson are of course brother Masons,belong to the Bilderberg Group and are Illuminati friendly.